For many photographers, the first mistake they make in composition is trying to fill the picture frame. I’m guilty of this myself, particularly with wildlife photography. There’s the big lens theory that you need to get a big fat piece of glass on the front of the camera so that you can fill that sensor with the leopard in a tree. For landscape photographers there’s the converse, little lens theory, that you get as wide a lens as possible so that you can fill the frame with as much of the landscape as possible. Then with all these wonderful big and small lenses we wonder why our images look dull and uninspired. It’s because filling the frame is not necessarily the best way to create a meaningful image. Sometimes, you need to leave it empty. Different teachers and writers talk about different aspects and use different terms when discussing space; negative space, dead space, white space, copy space and so on. Essentially the simplest way to think of space is that which is often taught to students learning to draw; that the three primary elements of a picture are: the frame, positive space and negative space. Positive space is relatively easy to understand. It is the pictorial space occupied by the subject itself. Negative space is then the pictorial space that surrounds the positive space. This is where many photographs leave the discussion. The thing is that negative space can define the positive. What we strive for in an artistic composition is often the balance between negative and positive. 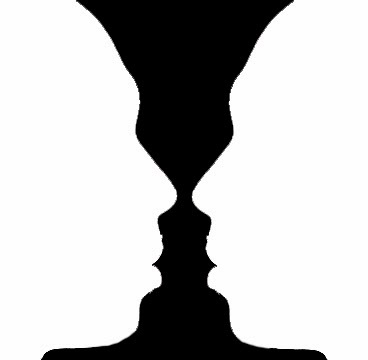 Consider the old visual trick where we see either a vase, or two faces looking towards one another (known as Rubin’s Vase). If you see the vase, your perceptual interpretation of the image is that the central portion is the positive, and the surrounding area the negative. If you see two faces the central portion is now the negative space. The important but often overlooked aspect of Rubin’s Vase, is that the negative space still implies or defines the positive. We can still see the vase, even if we draw the faces (and vice versa). This means that the negative space in an image is as important as the positive when viewed in the context of the frame. We’re not always photographing vases of course. Most simply, negative space can be used to create context within the images we create. If we place a tree, small in the frame to a lower corner and leave the rest literally open to the sky, we start to create an image that is playing with the idea of space. In this instance the vast area of negative space implies a lone tree in a large area. Themes like, ‘solitude’, ‘loneliness’ and ‘emptiness’ start to play through the mind of the viewer. Placing the tree in the horizontal centre of the image (but still low) again subtly changes the meaning of the image. Now the tree plays a more central role in the interpretation of the image. It becomes less about the open space and more about the tree’s role within that space. The above example assumes that the image effectively balances positive against negative space. Problems arise when there isn’t balance. This is when dead space can potentially occur. Viewers find that images that are well-balanced often guide their eyes around the image frame, scanning virtually all of the pictorial space. Dead space occurs when there are sections of the image that the viewer’s eye does not want to be drawn towards. Consider an image where we have a person standing in the centre of the frame looking out towards the right hand side of the frame. Because we empathize with the subject (this is automatic, we even anthropomorphize plants and animals to better interpret pictorial arrangement) we look towards the right hand side of the picture space. But what about the left? If there is nothing there to draw our eyes back into this portion of the frame this could potentially be dead space. Dealing with dead space literally becomes a balancing act. In this regard, this month’s opening image depicts a lioness looking out to the right of frame. She is not central, but rather placed further to the left. Notice how the eye comfortably travels between her and the empty area to the right. The implication is that she is looking towards this negative space, which in turn potentially defines the lioness’ place in the frame. Notice how the eye does not comfortably look behind her (to the left of the frame). Placing the lioness picture left effectively balances her against the negative space picture right. 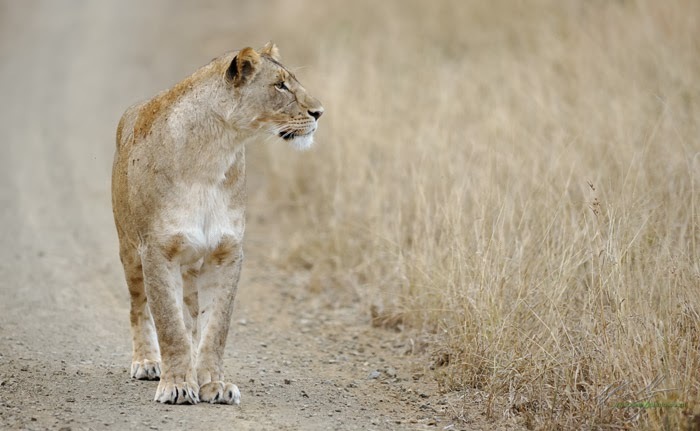 If the lioness were in the centre of the frame this balance wouldn’t occur and the image would probably fall flat. This is the essence of negative space: it tells us about the positive. Some photographers talk about white space when referring to a particular usage of negative space. This is the space that the subject is moving towards. Again, using the example of an animal or person, if we place empty space in front of where the animal is moving we get the impression that the subject is moving from point A to point B. Placing the subject slap bang in the centre of the frame begins to imply a kind of stasis. It’s not that the subject isn’t moving, but that the directional movement is no longer the emphasis of the image. Very importantly the eye travels from the subject in the direction that the subject is moving. Often the eye ends up momentarily resting on the white space rather than the subject. The Japanese have a word that they use that roughly translates to what is referred to here as negative space. The word ‘Ma’ is used to suggest a type of interval. Ma can also be described as a consciousness of place in that it can be the simultaneous awareness of both form and non-form. Importantly Ma is not something that is automatically created through composition, but is rather the imagining of the viewer as they look at the image. Emptiness in a frame can often tell us a whole lot more than a filled frame. Pauses and intervals are an integral part of poetry and the written word. Imagine a paragraph without any punctuation, or a poem without stanza or line form. This is a akin to filling the photographic frame without any meaningful space. Film-making and theatre are perhaps the art of the pause and empty space at their finest. The empty pause can be used to extreme effect by heightening tension (Hitchcock was a master of this). It leaves space for the imagination to literally fill in the blank (the concept of Ma). We also know that a change of scene or pace is sometimes followed by a pause. If photographic composition is about the arrangement of elements to convey a message, the elements themselves are the letters that make up the words. When the elements are arranged correctly we get words. Making sense of the words comes by inserting spaces and punctuation. Without space, all we see is nonsensical and chaotic.